Victoriperrea Hombr. & Jacquinot ex Decne. 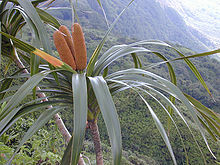 Freycinetia is one of the five extant genera in the flowering plant family Pandanaceae. The genus comprises approximately 180–200 species, most of them climbers. The species are distributed through the tropics and subtropics of South Asia and the western Pacific Ocean, from Sri Lanka eastwards through the mainland of Southeast Asia to the Melanesia floristic region, and southwards to northern Australia (Queensland, Northern Territory, northern New South Wales), Norfolk Island, and New Zealand. F. banksii is the only extant New Zealand member of the family Pandanaceae, and is found naturally as far south as the temperate South Island. They have been found growing in tropical forests, coastal forests, humid mountain forests and associated biomes, from sea level to mountains cloud forests. The genus was named by Charles Gaudichaud-Beaupré for Admiral Louis de Freycinet, a 19th-century French explorer. Usually they are dioecious and vines, climbing by aerial roots, or sometimes scrambling shrubs. ^ Stevens, P. F. (2001–2012). "Angiosperm Phylogeny Website – Pandanaceae Version 12 July 2012 with updates". ^ "Freycinetia arborea". Meet the Plants. National Tropical Botanical Garden. Retrieved 2009-03-21. ^ Hyland et al. (2010) [RFK 6.1] "Factsheet – Freycinetia excelsa". Retrieved 18 Mar 2013. ^ Hyland et al. (2010) [RFK 6.1] "Factsheet – Freycinetia marginata". Retrieved 18 Mar 2013. ^ Hyland et al. (2010) [RFK 6.1] "Factsheet – Freycinetia percostata". Retrieved 18 Mar 2013. ^ Hyland et al. (2010) [RFK 6.1] "Factsheet – Freycinetia scandens". Retrieved 18 Mar 2013. "Freycinetia". Integrated Taxonomic Information System. Hyland, B. P. M.; Whiffin, T.; Zich, F. A.; et al. (Dec 2010). "Home". Australian Tropical Rainforest Plants. Edition 6.1, online version [RFK 6.1]. Cairns, Australia: Commonwealth Scientific and Industrial Research Organisation (CSIRO), through its Division of Plant Industry; the Centre for Australian National Biodiversity Research; the Australian Tropical Herbarium, James Cook University. Retrieved 18 Mar 2013. This page was last edited on 23 March 2018, at 00:47 (UTC).